A male gopher tortoise was admitted to the clinic after it was struck by a vehicle. It suffered a front leg injury with damage to two of its claws. Something else was very peculiar about this tortoise when it arrived. It's carapace (top shell), plastron (bottom shell) and scales elsewhere on its body were discolored. Our veterinarians had not seen a case like this before. Samples of the discolored shell were sent for further testing to determine a cause. The results of the preliminary histopathology tests, which examine the affected tissue, have come back inconclusive. Samples for further testing will be taken this week. The tortoise has remained very bright and alert and has been eating well. The damaged claws which were removed have been healing very well. The gopher tortoise is scheduled to have a full-thickness biopsy taken of the affected area of its carapace for further testing this week. This test will hopefully help provide some answers as to what has caused the appearance of its shell. 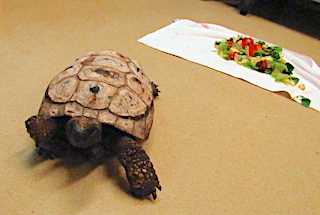 The tortoise has been receiving lots of fresh greens and has been eating well on its own. 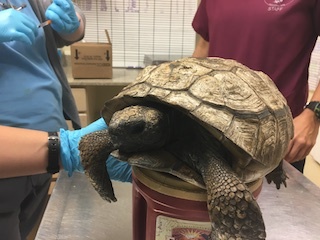 The gopher tortoise was one of many patients which deemed healthy enough for release prior to Hurricane Irma making landfall in Southwest Florida. 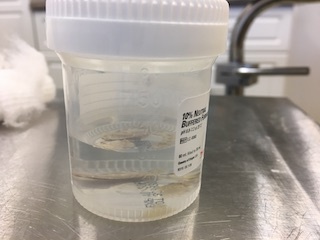 Veterinarians were unable to determine the exact cause of its condition regarding its scutes and shell. Weeks of observation deemed that the health of the animal was not affected by the condition of its shell.